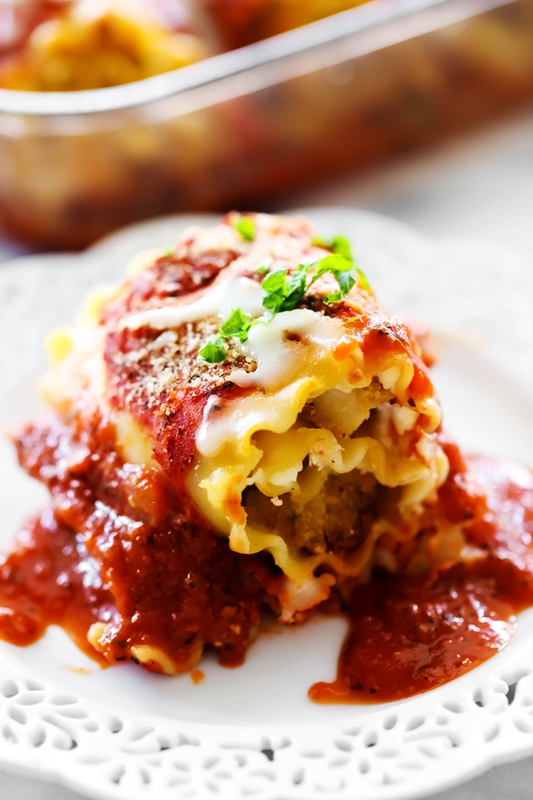 Breaded chicken and seasoned Parmesan Cream Cheese rolled up into lasagna noodles and covered in a delicious homemade marinara sauce. This dinner will quickly become a new favorite! There are 4 things I can always get my kids to eat. Noodles, Spaghetti Sauce, cheese and chicken- not necessarily together. These are four things all three of my kids can agree upon, which is a rare occurrence. Chicken Parmesan is one of my favorite meals. I love breaded chicken especially coated with my Homemade Marinara Sauce. This dinner got 2 thumbs up from my entire family. To find a meal everyone loves is something I call a huge success! I used Tyson’s Breaded Chicken to save on time, but you can easily make your own for an even more delicious meal. As a mom of 3 kids 6 and under, sometimes dinner needs a couple short cuts to make it onto the table at a decent hour. If you are in need of a quick meal that is picky-eater approved, give this one a try! It is incredible! Cook chicken according to the package. Cut chicken into bite size pieces. Set aside. In a medium bowl, combine softened cream cheese, parmesan cheese, onion powder, garlic powder and salt and mix well. Spray 9x13 inch baking pan with cooking spray. Set aside. On a large flat working surface, lay out cooked noodles. Divide cream cheese mixture into 12 portions and place on each noodle and carefully spread evenly over the noodles. Sprinkle 1½ cups mozzarella over noodles, reserving the rest for the top. Then sprinkle chicken evenly over noodles and roll up and place each bundled noodle into a prepared 9x13 baking dish sprayed with cooking spray. Pour sauce over noodles and bake at 350 degrees F for 50 minutes. Remove from oven and sprinkle the remaining cheese over the top and return to oven for 5 minutes until melted. 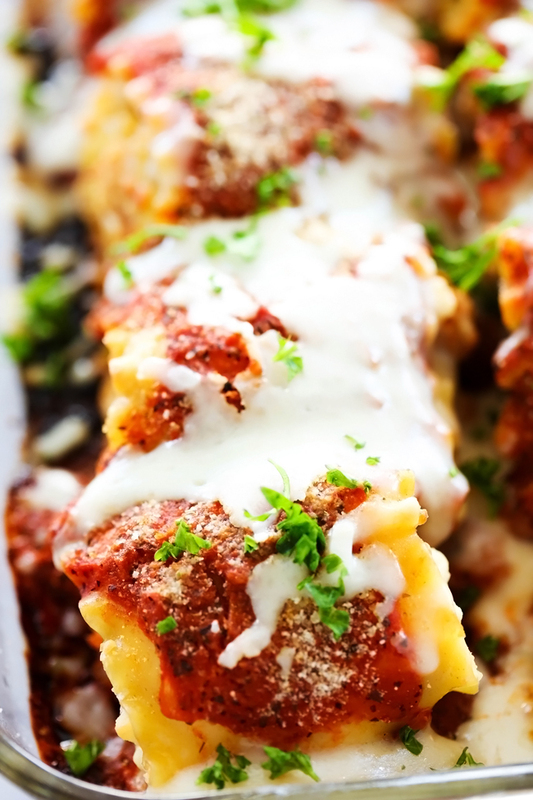 Can I say, I'm so glad to have found an alternative to the old-school lasagna recipe that is just so boring right now (after having had it like 334 times, just a rough estimate of course;) ). 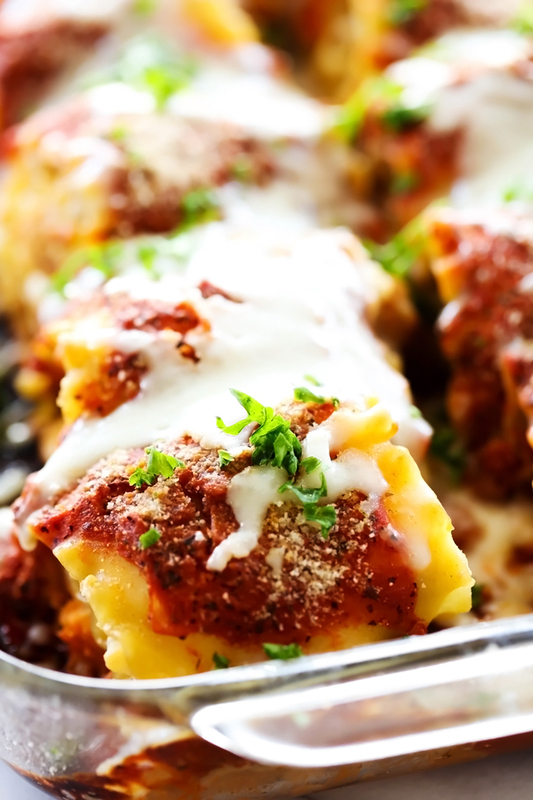 I happen to have half a pack of lasagna pasta in the pantry and I'm definitely going to whip this up for dinner one day with the kids. Thanks for sharing! I was curious when it said SPRINKLE chicken over the noodles, do you cut the chicken into small pieces?? It states: "Cut chicken into bite size pieces"
Very tasty, and super easy. Only one change don't add the salt. I tried this last night and let me tell you it was QUITE the hit! Everyone went back for seconds. There was nothing left. My husband asked me to add this to the dinner rotation and my boys asked if we could have it for dinner again tonight. THANKS!!! I love all your recipes...they are great.the ones I tried turned out good...thanks. I guess I like cheese to much, took me 3+ cups to make this Awesome dinner. This is definately in tue regular rotation.